When Bella West crash lands on a notorious prison planet, the only thing standing between her and a mass of brutal criminals is one of their own, a ruthless loner known only as 673. But what starts out as a desperate trade based on protection and raw lust soon blossoms into a scorching need that will push them both to the edge. 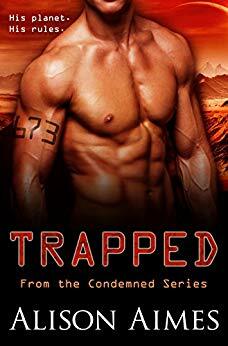 A tale of unbridled desire, stunning sacrifice, and unwavering love, Trapped is a standalone, action-packed, scorching romance that asks: how far would you go to survive? $0.99 on Kindle.